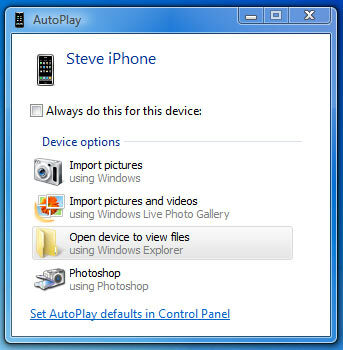 Every time I connect the iPhone to my PC Windows shows an AutoPlay dialog with four useless options. I want Windows to do nothing because iTunes automatically starts to charge and sync my device. Unfortunately, there is not a “do nothing” option on this screen like other AutoPlay dialogs. Scroll down to the Devices Section and locate the hardware device. In this case “Steve iPhone.” Change the option in the drop down list to Take no action.